Continue on to read the blog entry from Jake Stein. It’s almost time to get your popcorn ready. You still have the opportunity to do sit-ups in the driveway. So hurry up and get fitted for that gold jacket because Madden NFL 19 has officially been announced and I’m thrilled to deliver the first bit of news. Madden Ultimate Team has some exciting things to share so let’s jump right in! The design that drove the most amount of feedback in MUT 18 was unquestionably Power Up Players. It allowed you to have the most powerful version of a player, but it came with some limitations that we could not handle without additional development. We definitely heard and understood the feedback and invested in building support for Power Up Players with Player Upgrades in MUT 19. Let’s start from the beginning and discuss what made upgrading players difficult in Madden NFL 18. First of all, it took a lot of exploring through Sets and knowing exactly what you needed to do. This may not apply to everyone who is dedicated enough to read this blog, but Power Ups were too complicated. You needed to know how to navigate through the Sets UI, understand how to get Team Tokens, and then what you could actually do with them. Our first goal for Madden NFL 19 was to streamline this process and it started with building a new currency type – Training. 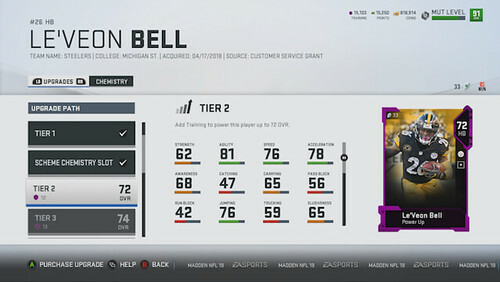 Training is one of the things you’ll need to Power Up Players in MUT 19. The primary way you’ll earn Training is by quick-selling items you don’t need. More on Training a little bit later. Now we can move onto the next layer of accessibility we added to upgrading players – removing the need to go to Sets. Wouldn’t it be easier if you could just upgrade players from the item itself instead of getting lost in one of the hundreds of Set paths? Yup, we agree. Now when you click on a player, the first thing you will see on the back is an option to Upgrade. If that player has an Upgrade option, you will be launched into the new Player Upgrades UI. As you can see in the image above, you now have full access and visibility into all the upgrade options that player has. Also note that some Tiers require Training while others require a specific item. Navigating through the different tiers will also show you what that player’s new ratings will be every step of the way. In this example, you have acquired the base version of Aaron Rodgers’ Power Up. This item is auctionable/tradeable up until the point where you invest 100 Training into him and reach Tier 1. From there, put 200 Training more into him to reach Tier 2. And finally, after acquiring his 86 OVR Core Elite, you place that into the Power Up as well. If you want to go backwards and stop investing in Aaron Rodgers for whatever reason, you can choose to downgrade. When you downgrade from Tier 3 to Tier 2, you will get that Core Elite Aaron Rodgers back (and if that Core Elite was auctionable when you invested him, he will return as auctionable). Going from Tier 2 to Tier 1 will get you a percent of the 200 points of Training you invested back. We are still determining what that percent will be, but we will let you know as soon as we have settled on that number. 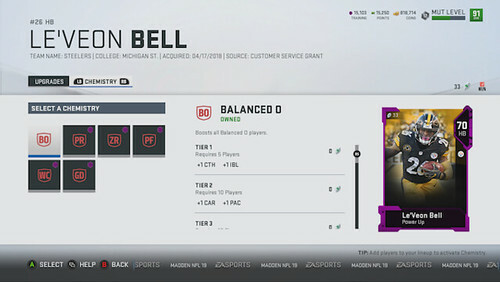 And finally, going from Tier 1 to the base will make the base item auctionable again. Sounds a whole lot better, right? You acquire a Core Gold player. When you acquire him, he has nothing but his Team Chemistry equipped. But when you click on the player and choose to upgrade him to Tier 1, you unlock his “Scheme Chemistry” Slot. From there, tab over and you’ll see that you have a bank filled with all the available Scheme Chemistry options. You get to choose which one to equip. And just as we’ve done with the upgrade tiers, you’ll have the ability to remove or change Chemistry as well. If you have equipped Balanced Offense but want to change it to Go Deep, go right ahead. Madden Ultimate Team wants to continue delivering more ways to let you personalize and customize your team and being able to choose your Chemistry load out is a great opportunity to further that goal. It’s worth noting that not all players will have the same Chemistry options, especially when it comes to Chemistry Abilities. Players will need to be at a certain OVR or have a specific attribute at a certain rating threshold in order to have that Ability appear in the bank of Chemistry choices. We’ll do our best to share that information in more detail after we’ve had time to tune those values. Another feature we’re really excited to talk about is Solo Battles. Solo Battles brings the competitive feel of Weekend League to players who are more comfortable taking on the CPU. There will be 13 games per week, and in each game you will try to earn the highest Battle Score. Battle Score is earned from completing a Solo Battle game, winning a Solo Battle game, and the stats you accumulate in that game. There’s one additional factor for determining how many Battle Points you can earn and that’s by choosing your modifier. The modifier is a combination of difficulty and game style. The higher the difficulty, the higher the multiplier. Solo Battle games are full game challenges vs. the CPU. The quarter length is set to three minutes and you will have only one chance to record the best possible results. 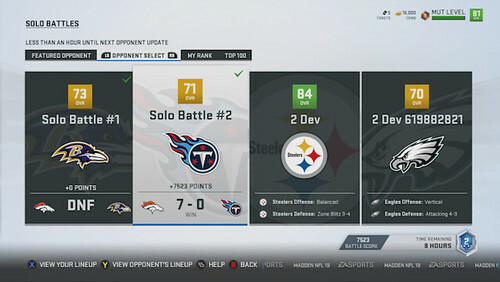 There is no restarting or replaying a Solo Battles game like you can in a traditional Solo Challenge. Each week your goal will be pretty straightforward – earn as many Battle Points as possible. 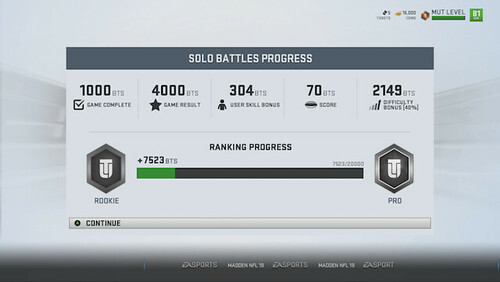 The reward structure for Solo Battles will look fairly similar to Weekend League. There are 14 different reward tiers, which includes players who are in the Top 100. We’re not quite ready to detail the exact rewards for launch, but we plan on sharing those details when we get closer to that date. There’s one more really unique aspect to Solo Battles worth mentioning. While you are playing against the CPU, the roster will be comprised of real-life MUT teams. That means if you are participating in MUT, you are potentially eligible to have your team chosen and represented in Solo Battles. And while it would be really exciting to have your team show up in Solo Battles, it’s just as exciting for the people playing. 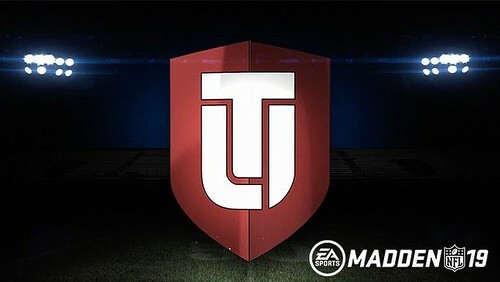 Since we are constantly pulling teams from the community each week, the rosters you are facing will always be in tune with the latest content in Madden Ultimate Team. 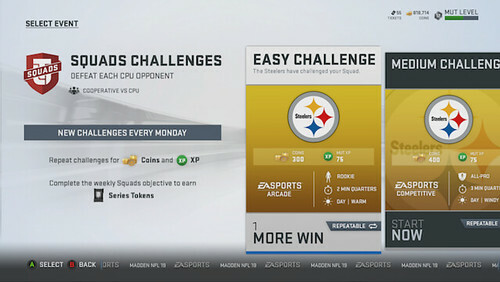 MUT Squads returns in Madden 19 and, new this year, we have added the ability to play games against the CPU. You and two of your friends can team up to take on challenges that will be a mix of various difficulties, playstyles, and even weather. We will produce weekly challenges and plan on continuously updating that throughout the year. While there are only a few new Squads Challenges each week, you will be able to replay them over and over for a consistent coin reward. In addition, there will be a sizable first-win reward and an extra incentive to beat each of these challenges at least once every week. We’re excited about Squads Challenges because it offers a platform for players who just want to go have some fun together and not worry about having to play against another team of three. Also, Squads Challenges serves as a pseudo practice environment for Squads that just want to get some extra reps in before taking on the competition. And regardless of how you want to engage with Squads Challenges, there’s no doubt that we will be offering up some unique challenges that will put you and your team to the test. There’s a long-term roadmap for our vision of what Squads can evolve into. This is just the tip of that vision and we look forward to continue building towards those goals. I’ll save the deep dive for a future blog, but at a high level, these positions were created so that gameplay could tag formations with these new specialist positions. So for instance, instead of having to manually sub a defensive end down to defensive tackle out of Nickel, just assign that player to your Rush Defensive Tackle slot and he’ll already be there every time you call a Nickel defense. And since we’re on the topic of the MUT lineup screen, we should discuss some changes we made there. First of all, we felt like there was too much depth. There’s no reason to have positions like offensive lineman needing three total players per position, or five kick and punt return slots. So we shaved off the excess and then decided to make all the remaining positions for offense and defense count towards Chemistry. There are now 25 slots on offense and 25 more on defense that count towards Chemistry. As long as you are playing someone in their natural position, they will be contributing to your team even if they never see the field. This does mean that Tiers of Chemistry will take more players to activate in order to balance out having so many more Chemistry slots than in year’s past. Well, that’s a pretty in-depth look into what we’re working on and thrilled to deliver to you. Be sure to check back as more blogs for Madden NFL 19 continue to drop. Thanks for making it this far into the blog and being a big part of the Madden community. As a reward, I leave you with one final note. While I’m super pumped to see all of you checking out Madden NFL 19, there is one thing that I know won’t be making the trip – contracts. There are now 25 slots on offense and 25 more on defense that count towards Chemistry. As long as you are playing someone in their natural position, they will be contributing to your team even if they never see the field. I get it in theory but it's often not the case in practise. I just think of the players who often are successful in different schemes. That and trying to figure out how to replace the Franchise Mode with a Battle Royale.